As a specialist referral centre for young patients from all over Queensland, northern New South Wales and beyond, Mater Children’s Hospital faced increasing pressure on its services during the latter part of the 1980s and early 1990s. In order to relieve that strain and ensure it was well equipped to face the medical challenges of the 21st century, Mater committed to constructing two new Children's Hospitals for privately insured and non-insured patients. On 16 May 2001, a new Mater Children's Hospital and Mater Children's Private Hospital was officially opened on Stanley Street by the Governor of Queensland, His Excellency Major-General Peter Arnison, AC and blessed by the Archbishop of Brisbane, The Most Reverend John Bathersby, DD. The new Mater Children’s Hospital, with its external façade designed to reflect the essence of Queensland—blue skies and brown land, sparkling seas and tranquil creeks—was designed to be family-focused. Overnight accommodation was provided for parents in every ward and single room, parent lounges and special relaxation areas for teenagers were created, indoor and outdoor play areas were designed and ample space allowed for performers visiting the hospital. Ceramic tiles designed by children were installed on many walls; windows and service counters were built at child height; the chapel was designed to be welcoming to children and, in 2003, a bright, light-hearted animal mural was painted on a corridor wall to lead children from ward areas to play areas. The new hospital also became the first in Queensland with a Starlight Room contributed by the Starlight Foundation and supported by Australian tennis champion Pat Rafter. On 12 June 2008, The Queensland Paediatric Cardiac Service was officially opened at Mater Children's Hospital by the Minister for Health, The Hon. Stephen Robertson MP and blessed by the Auxiliary Bishop for Brisbane, The Most Reverend Brian Finnigan, DD. On 6 July 2011, Mater Children's Hospital celebrates its 80th birthday with a special birthday party. In June 2001, Sister Angela Mary Doyle AO was named a 'Queensland Great' for her outstanding contribution to the Queensland community. Sister Angela Mary Doyle arrived in Brisbane from Ireland in 1948, and was despatched to Mater to train as a nurse. However, hospital administration, rather than nursing administration, was to be her strength and Sister Angela Mary was Administrator of Mater hospitals for 22 years. In response to the continuing need to raise funds for research and new healthcare services, Sister Angela Mary became Executive Director of Mater Trust from 1993 to 1997 and served on the board until 2003. Her recognition as a ‘Queensland Great’ is one of many awards she has received, including Queenslander of the Year (1989), Australian Achiever Award (1990), Order of Australia (1993) and the Premier’s Millennium Award for Excellence in Charity/Welfare. In June 2002, Professor David Tudehope, Director of Neonatology was also named a 'Queensland Great' for saving many lives and encouraging others to explore new neonatal technologies. A distinguished physician and author, Professor Tudehope has chaired a number of paediatric committees and was appointed Mater’s Director of Neonatology in July 1977. During almost 30 years in that position, Professor Tudehope and his team of doctors, nurses and surgeons cared for more than 30 000 babies. Mater’s Neonatal Critical Care Unit has grown to become one of the largest within Australia, providing care to more than 2000 babies each year. On 30 May 2006 Premier Peter Beattie named Mater a Queensland Great, an honour normally reserved for individuals, officially recognising Mater as one of Queensland's oldest and most respected healthcare providers. On 11 June 2009, Dr Robyn Rodwell, Director of Queensland Cold Blood Bank at Mater and Chief Scientist of Haematology Molecular Genetics was named a Queensland Great by the Premier of Queensland Anna Bligh MP. In July 2001, Australia's first artificial cervical (neck) disk replacement was successfully performed by a surgical team at Mater Private Hospital Brisbane. Two years later in 2003, Mater Private Hospital Brisbane commissioned its ninth operating theatre. The theatre, which was the only one of its kind in Australia, was equipped with video technology that allowed surgeons to watch operations performed by visiting international specialists. It also enabled teleconference links to any teleconferencing venue in the world. In 2004, Mater Private Rehabilitation Unit was opened in the Potter Building, expanding the service with a further 48 beds. In 2004, Mater announced its intention to build a new Mater Mothers' Hospital to provide the exceptional maternity services required for Queensland's growing population. Mater Adult Hospital would also be extensively refurbished as part of this project, for which the Queensland Government committed A$111 million funding. Work on the Mater Redevelopment project commenced the following year, in 2005. Three years later, the new Mater Mothers' Hospitals were officially opened and commence caring for women and their babies from Wednesday 4 June. On 4 January 2006, Mater celebrated 100 years of exceptional care with a special ceremony to mark the opening of the first Mater hospital in Brisbane. More than 200 people gathered to mark the occasion and pay homage to an organisation known for its commitment to the people of Queensland. The ceremony also launched a year of festivities to celebrate the centenary. Four years later, Mater celebrated ‘100 years on Mater Hill’, acknowledging a century of exceptional care provided from the now extensive South Brisbane campus. Mater also marked 50 years of providing maternity services to the community through Mater Mothers’ Hospitals. The following year, on 2 February 2011, Mater Adult Hospital commemorated 100 years of providing healthcare services to the public. The first public hospital, now known as the Whitty Building, was opened in 1911 to address the healthcare needs of Brisbane’s growing community to the south of the Brisbane River. Following the establishment of Mater Private Hospital Redland in 2000, Mater has continued to expand healthcare services beyond the always busy Mater Hill. In 2010, Mater commenced a strategy to provide non-hospital health services for developing communities through Mater Health Centres. Three health centres were opened across the greater South-East Queensland region: Mater Health Centre Brookwater, Mater Health Centre Hope Island and Mater Health Centre Redland. 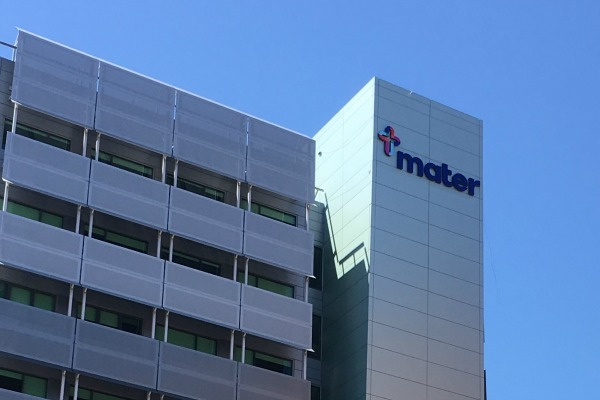 In 2013, Mater also announced plans to construct Mater Private Hospital Springfield, extending hospital services to the Greater Springfield area. Stage one of the hospital when complete in 2015, will provide a range of medical and surgical services. In December 2015, Mater Private Hospital Springfield was officially opened by His Excellency, the Honourable Paul de Jersey AC, Governor of Queensland, and blessed by the Most Reverend Mark Coleridge, Archbishop of Brisbane. In 2001, Mater's Mucin research team discovered the MUC13 gene, important to colorectal cancer, which gained international recognition. Two years later, then Queensland Premier, Peter Beattie, launched Mater Prostate Cancer Research Centre, thanks to a A$1 million donation by Brisbane businessman, Bill Siganto. In October 2009, Professor John Prins was appointed to the role of Chief Executive Officer and Institute Director of Mater Medical Research Institute (MMRI). On 4 March 2014, Mater Research, formerly Mater Medical Research Institute, celebrated its 15th anniversary. From humble beginnings, with just 10 staff, Mater Research has grown into internationally-recognised institute with many original research programs attracting top scientists from around the globe and more than 250 research staff, postgraduate students and honorary clinical researchers. On 1 July 2001, Mater was formally incorporated as Mater Misericordiae Health Services Brisbane, one of the last Catholic hospitals in Australia to be incorporated. The canonical responsibility of Mater Health Services Brisbane Limited including its associated entities: Mater Foundation and Mater Research, was officially transferred from the Sisters of Mercy to Mercy Partners on 23 April 2013. Mercy Partners is a Catholic Church entity established in 2008 following approval from the Vatican. On 29 November 2014, after providing exceptional care to Queensland children for more than 83 years, Mater Children’s Hospital closed, and government-funded paediatric services transitioned to Lady Cilento Children’s Hospital. Mater will continue to offer paediatric services for privately-insured patients through Mater Children’s Private Brisbane and will enhance services for young people through Queensland’s first dedicated adolescent and young adult health service. Mater Mothers’ Hospitals will continue to grow and deliver the highest standards of maternity and neonatal care. Following the closure of Mater Children’s Hospital, and to reflect on our rich heritage and links with our founders, the Sisters of Mercy, two buildings on ‘Mater Hill’ were renamed on 29 November 2014. The Mater Children’s Hospital building and Mater Corporate Services Building were renamed to commemorate the significance and vision of Mother Alban Salmon and Mother Damian Duncombe OBE. The Mater Children’s Hospital building was renamed as the Salmon Building (in memory of Mother Alban Salmon, 1880 to 1951) and the Mater Corporate Services Building became the Duncombe Building (in memory of Mother Damian Duncombe OBE, 1899 to 1980). Mater’s proud neurosciences history began in 1954 with the formation of Queensland’s first neurosurgery department with Dr Peter Landy as physician and Dr Geoff Toakley as neurosurgeon. Today, Mater’s commitment to neurosurgery is still evident through its adoption of state-of-the-art technology and clinical practices. In June 2015, Mater opened the Mater Centre for Neurosciences. From one dedicated location Mater Centre for Neurosciences provides specialist care for stroke, epilepsy, neurosurgery, neurology and spinal surgery. On 27 July 2015 the newly appointed Chief Executive Officer (CEO) at Mater Health Services Brisbane, Dr Shane Kelly, took the reins of the organisation. Taking over from Dr John O’Donnell, who held the position of CEO for 14 years, Dr Shane Kelly joined Mater at a pivotal time, following the transition of Mater Children’s Hospital to Lady Cilento Children’s Hospital, the re-purposing of the vacated capacity and prior to the new Mater Private Hospital Springfield which opened later in 2015. With a senior health management career spanning more than two decades, Dr Kelly said he was delighted to have the opportunity to lead Mater Health Services into the future. On 22 February 2016 Mater surgeons successfully performed Australia's first surgery using the ROSA robot, giving new hope to people with epilepsy. Mater Neurosurgeon Dr Jason Papacostas said thousands of Queenslanders suffer from epilepsy; a neurological condition that affects the nervous system. “Epilepsy affects up to 90 000 Queensland families, many of whom do not respond to medical treatment and therefore surgery is their best option. ROSA, a Robotized Surgical Assistant, represents a new milestone for neurosurgeons and their patients, halving surgery time and offering increased efficiency, security and flexibility. Epileptologist Dr Sasha Dionisio said that for the first time, patients with refractory epilepsy can undergo the Stereo EEG procedure in Queensland. In February 2016, the transformation of Mater’s heritage-listed Whitty Building into a world-class health education precinct was completed, following the completion of 12 months of construction works. Originally constructed in 1911, the newly refurbished building includes training facilities and a clinical school for medical, nursing and midwifery, and allied health students. The new facility will host students from Mater Education and The University of Queensland. Named in honour of Mother Mary Vincent Whitty, the Whitty Building served as the Mater Public Hospital from February 1911 until November 1981, when Mater Adult Hospital opened. Many of the building’s historical features have been preserved and restored throughout the redevelopment to ensure that the historical value of the Whitty Building is never lost. The Whitty Building was officially opened on 20 April 2016. During the ceremony, the building was blessed by His Grace, The Most Reverend Mark Coleridge, Archbishop of Brisbane. The opening was attended by Queensland Health Director-General Mr Michael Walsh, Mater and UQ Board and Executive, and the project team. On 23 July 2016 a team from Mater, in collaboration with a team from Vanderbilt University Hospital in the USA, were the first in Australia to have performed in-utero spinal surgery on a baby diagnosed with spina bifida at Mater Mothers' Hospital. Spina Bifida is a condition where the lower part of a baby’s spine is open and it affects 1 in 2000 pregnancies in Australia. Currently families often discover the diagnosis of spina bifida at their 18 to 20 week ultrasound scan and to date, Australian parents have had to wait until the baby is born to perform surgery. Mater’s team, led by Director of Maternal Fetal Medicine Dr Glenn Gardener, performed the surgery on a 24 week-old in-utero baby on 23 July. This surgery was able to be carried out, thanks to donations including one from the Mater Mothers’ Hospitals Auxiliary. On 21 November 2018, Mater launched a new chapter to our story to reposition Mater as a group incorporating health, education and research for a healthy community. Mater’s new brand is an important visual prompt for our community, highlighting that Mater has changed. Founded by the Sisters of Mercy more than a century ago, Mater has become an icon of compassion and mercy throughout Queensland and Australia. Over that time Mater has also become more than a hospital, or a group of hospitals. Mater has grown its capability and is an emerging leader in health education, and accomplished researchers and collaborators while continuing its proud history of philanthropy and fundraising. The launch of its new branding marked an exciting step forward for Mater in line with its new strategic direction of integrating Mater Health, Mater Education, Mater Research and Mater Foundation to improve the health of our community.